Boscobel Beach Resort in located on the north coast of Jamaica, about 10 mile east of Ocho Rios city center. Sangster International Airport in Montego Bay is approximately 76 west of Boscobel Beach Resort and is the major gate way for visitor arriving on the north coast to start their vacation. Boscobel Beach Resort is less developed than Ocho Rios and its peaceful idyllic location is perfect for those who want to relax and unwind. Getting away really mean getting away from the hustle and bustle of life and just chill out by the beautiful Caribbean sea surrounded by lust tropical rain forest that stretches for miles. The beaches here are sheltered by coral reefs making perfect for everyone to soak up the warm tropical sun or go swimming in the calm turquoise waters. You can also enjoy the great water sports activities on offer such as deep sea fishing, sailing, jet skiing, parasailing, water skiing and windsurfing. The resort is flanked by a small village along the coastal road with easy access to the main town of Ocho Rios. The main resort hotel is the Beaches Boscobel Resort and Golf Club Jamaica a family oriented, all-inclusive resort located on a private beach. In the village you have a few local restaurants and bars where the locals and occasional tourists hang out. 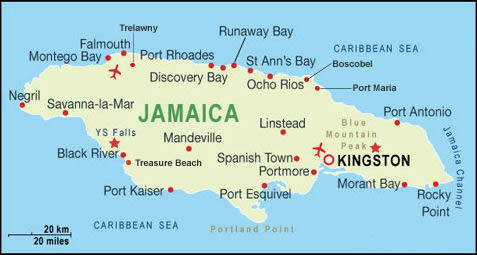 Here you will also find the Boscobel Airport and is located approximately half way between Montego Bay and Kingston. Boscobel Airport has 1 runway, which is 3000 feet (914 metres) long. Close by is village of Orcabessa which is a more developed but still maintain a village atmosphere. Where you find the famous all-inclusive Goldeneye nestled among tropical forests and lush gardens on a seaside bluff overlooking the Caribbean. This is where Ian Fleming crafted all his James Bond novels. The James Bond Beach Club is one of Jamaica's most stylish beach, a small strip of white sand offers beach facilities, a watersports centre, bar and restaurant. Between Orcabessa and the town Port Maria, you'll find Noel Coward's former estate, Firefly. The exquisite home of songwriter and international celebrity Noel Coward is now open to the public. The Government of Jamaica has deemed it a national monument and the exhibition depicting Sir Noel's career. Near by is the Brimmer Hall Plantation Tour; the Plantation Tour Eating House offers typical Jamaican dishes for lunch, and there's a souvenir shop with a good selection of ceramics, art, straw goods, woodcarvings, rums, liqueurs, and cigars. Also the Brimmer Hall Great House; the Bimmmer Hall Great House was built during the 18th Century by the plantocracy during the days of slavery. Visit the town of Ocho Rios where you can go shopping in one of its many shopping plazas, boutiques shops, duty free shopping for Jamaican rum, jewelry or the local craft markets selling local handicrafts and souvenirs. There are wide varieties of restaurants available you can sample spicy local dishes, enjoy fine contemporary cuisine or eat at one of the major fast food chains. Just west of Ocho Rios you will find Dunn's River Falls, one of Jamaica's most famous natural attractions, where you can marvel at the beautiful cascades and swim in the refreshing cool waters. Take the time out to go horse back riding, white water rafting, quad biking, swimming with dolphins at Dolphin Cove, Green Grotto Caves, jeep safaris, helicopter tours and many more.